In the end, this was exactly as LeBron James had imagined it. Maybe the journey was not quite as easy as he had hope, but it wasn’t that hard either. And the ending was easy. There he was working into the defense, magnetizing two and three and four defenders, kicking the ball out to a wide open man who cooly made a three-pointer. Miami made 583 out of 589 three-pointers on this night. That might not be an exact figure. But it’s close enough. There was a freaked out Oklahoma City team — all of them so young, so raw, so swept away by the moment and the hopelessness of it all. 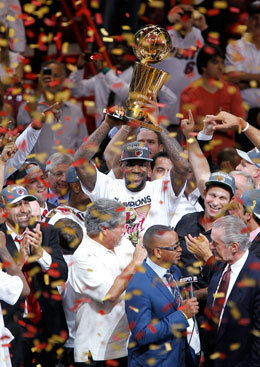 There was LeBron James holding the trophy. Yes, it turned out just as LeBron had said it would. There was some pain along the way. There was some disappointment along the way. But, let’s be honest, there wasn’t a lot. LeBron came to South Beach to win championships. He did what no player had ever done — he teamed up with two of the biggest stars in the world, he announced on national television his intention to take over the NBA and have a lot of fun doing it. He did just that. And it didn’t take long. In his second season, he and Dwyane Wade and Chris Bosh and a handful of what John Updike memorably called “gems of slightly lesser water” won their first championship, won it going away. The last quarter was a Beach Party, with the game decided, with LeBron making crisp passes leading to three pointers and dunks, with the insatiable crowd able to enjoy being the best without the inconvenience of a close score. He didn’t just win a championship. He won. Period. As an acknowledged LeBron Clemenater, it was a lousy night. I had promised to root against LeBron until the end, and I did, but it was fruitless and it was pointless. Oklahoma City — as talented as it is — was not ready to win a championship. And this was Miami as I had feared it might be. When LeBron made “The Decision” and chose to play in Miami with Wade and Bosh, those first days, I had little doubt that he immediately would win a championship, or two or six. I mumbled some wishful thinking to friends about how “winning a championship might be harder than he thinks,” but it was only that: wishful thinking. Then, there were a few hopeful signs. The team began to show some bad tendencies — the games of LeBron and Wade did not seem to blend — and then James seemed to tense up in some big moments, then they lost to a Dallas team that really wasn’t as good as the Heat. This year, I didn’t think the Heat were the best team. I thought Chicago was better. But we’ll never know. Derrick Rose got hurt. I thought San Antonio was better. But the Spurs got old overnight, which is how getting old usually happens. I did not think the Celtics had any chance at all against Miami, but sure enough Boston took a 3-2 lead going into Game 6 at home — and that’s when LeBron dug as deep into himself as he ever had and played as dominant a basketball game as I’ve ever seen. The Celtics wilted away in Game 7. Then came this series against Oklahoma City, and in the first game, the Thunder played loose and young and free, and wishful thinking buzzed and rumbled. But sooner or later wishful thinking runs out. 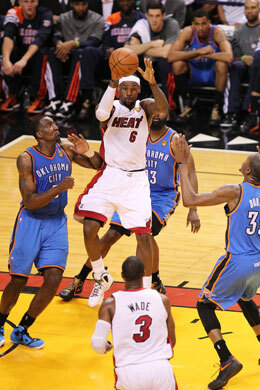 Oklahoma City was not good enough to beat the Heat — not yet. The Thunder played too sloppy, too nervous, too wild. I once asked Martina Hingis, when she was the No. 1 women’s tennis player in the world, what is the difference between the best and the near best. “Loose points,” she said, and it seemed to me that Oklahoma City played way, way, way too many loose points to win a championship. Bad fouls. Bad shots. Bad defense. Bad. And Miami played focused and, to invent a word, undistractable. The role players — Shane Battier, Mario Chalmers, Mike Miller — had their big moments. Wade was unstoppable in stretches, Bosh grabbed the big rebounds. And James was brilliant in the understated way he loves being brilliant, where he’s involving everybody, where he’s finding open players, where he’s not scoring 40 points or shooting 25 times. He had to do that against Boston with the future at stake. He did it. This series was much more comfortable. Wilt Chamberlain averaged 22 points, 29 rebounds (!) and nine assists in the 1967 playoffs. Bob Cousy in the 1959 playoffs averaged 20 points, seven rebounds and 11 assists. And so on. This was LeBron playing not only at the highest level, but doing it his way — in the flow, in the moment. This has always been true of James — he plays unselfishly, and he loves when his teammates rise to his level. Finally, it was the clinching game, and this was precisely the Miami team I had feared. Oklahoma City had to sell out to slow down James. That left Mike Miller all alone. That left Shane Battier all alone. That left Mario Chalmers all alone. NBA players — even role players — can do remarkable things when they are left all alone. I wrote just yesterday that LeBron is much more fun to root against than he is to root for. I still think that’s true. I do wonder now if he becomes less interesting, if the NBA becomes less interesting, not for the real fans who will always love the game but for those who checked in to see the human drama. There is no question that LeBron’s chase for a title made the league more fascinating for me. Now he’s won it. There are people saying that with him free of that pressure, LeBron might go on a Michael Jordan-like championship run. Maybe he will. Maybe he won’t. I remember years ago, my wife and I used to watch the television show “ER” religiously. That was when Clooney was on it, Julianna Margulies, William H. Macy and so on. And then, one day, we just stopped watching it. I don’t remember why. Clooney had left, Margulies had left, but I don’t recall those being the precise reasons. The show had just run out for us. Maybe that’s how it will be for me and LeBron. And maybe not. I did think, watching the last minutes of the game, how amazing that scene would have been in Cleveland. Everybody knows it has been almost 50 years since Cleveland won a championship of any kind — the place where I grew up has not won a championship in my lifetime — and everybody knows about the torture and agony of that half century. The drive. The fumble. The shot. The interception. The error. The pain. It’s wrong for me to say Cleveland deserved that moment more than Miami did — Miami fans who have now won two NBA titles and two World Series in the last 15 years — but of course that how I felt. I guess, in the end, LeBron was just another in a long line of Cleveland letdowns. In the 1970s, a gritty group of Cleveland Cavaliers somehow kept winning all the way to the Eastern Conference finals. In the 1980s, a Boardman kid named Bernie Kosar manipulated the system so he could play for his hometown Browns, In the 1990s, an astonishing series of good decisions led to one of the greatest offensive teams in baseball history. In the 2000s, a high school phenomenon from Akron, LeBron James, somehow, by the grace of fate, ended up playing for the hometown Cavaliers. All of these ended badly, The Miracle Cavaliers lost, were purchased by a madman and ended up so bad the league had to step in and prevent them from making more idiotic trades. The Kosar Browns lost three AFC Championship games, the first two as heart-wrenching as any in the league’s history. The 1990s Indians powered their way two World Series but lost the first when the offense dried up and the second when they fell apart in the late innings. And LeBron left. Of course it was his right. Of course the Cavaliers did not build a good enough team around him. Of course he was frustrated by teammates who did not rise with him. Of course he was disoriented by a city so hungry for a championship. Of course Miami has warm weather and star power and beaches — those things Cleveland lacks. In the end, it ended as it had to end. Cleveland waits. And LeBron James won just like he knew he would.